The latest fitness phenomenon T25 workout created a stir among the fitness circles. Introduced by Shaun T, the creator of Insanity workout, Focus T25 is regarded as one of the “next generation” fitness solution that will build muscle, eliminate fat, and boost your energy within just 30 minutes. Focus T25 took groundbreaking research and rolled it into the most powerful workout that has the potential to completely change your body (and the way you look at fitness) forever. The secret behind the workout is that Shaun T shrinks hour-long workouts into just 25 minutes so that anyone can take on the explosive fitness training anywhere and produce amazing results. In our busy lives today, one of the major reasons for gaining weight is not having enough time to work out. Focus T25 burns this excuse to the ground and brings you a high intensity workout program that will only take 25 minutes of your time and give you the best weight loss results! How Does This Program Really Work? Shaun T promises to offer real results by using the Focus Interval Training and combines plyometrics, explosive cardio, and body weight exercises that will change the way that your body responds. Unlike all the other workouts available on the markets, Focus T25 does not include any rest sessions so you will be sweating like crazy. Many sure that you stay hydrated to handle the intense for full 25 minutes. The best choice is to take Shakeology post your workouts to get complete nourishment and energy, while boosting the recovery time. What Should You Expect from Focus T25? Every single time you use Focus T25, you will work all the muscles in your body to the level of exhaustion. Although it is fairly easier than Insanity workout, but will definitely take you out of your comfort zone and push you to do insane amount of exercise every day. 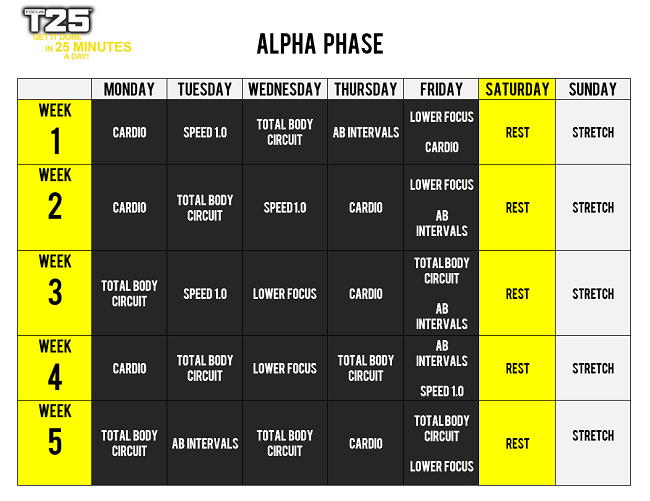 Alpha phase is the best way to start your fitness. You will be doing the cardio and abs building exercises to bump up your metabolic rates and make your body ready to get ripped. 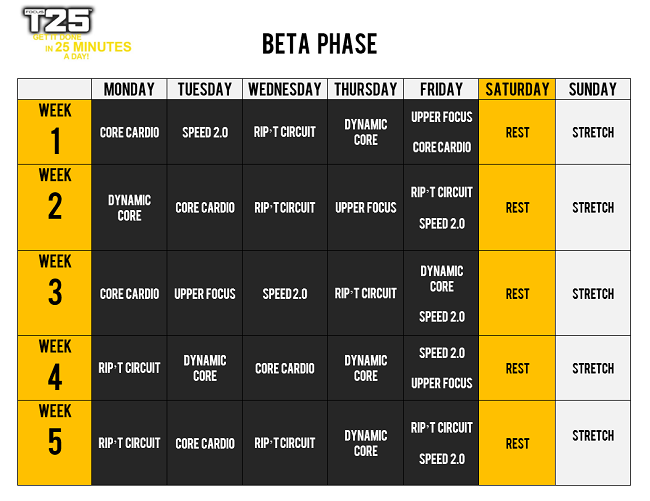 After a month of Alpha Phase routines, Beta phase will start and rev up your workouts to new levels. Beta phase is much more intense as the basic focus is to build the muscles fast. Another great thing about the workout is that it will satisfy the fitness needs of beginners as well as other fitness veterans who want to push their bodies hard in the shortest time possible. As long as you are sweating and giving your best, you are golden. In the end, I would have to say that Focus T25 workout results will give you ripped look through gradual progression and take you to a pro-athlete level with only 25 minutes-a-day workout!